King Leopold II's long reign (1865-1909) was a flourishing period. The capital's building sites buzzed with activity. Every artistic discipline went through a creative heyday. Brussels became a meeting-place for intellectual and artistic movements. Both in Europe and on the other side of the Atlantic all hope was pinned on technological and industrial progress. It was the start of mass production and consumerism. Thanks to new iron and glass techniques in the building sector it became possible to span large areas, so letting the light flood in. More and more often solid walls would be replaced with iron pillars, thus opening up façades. Inner areas became lighter and more open. A veritable revolution took place in the world of architecture. Bourgeois houses in Brussels city centre became ideal test cases for this new aesthetic movement, as it was launched by a small group of artists, industrialists and intellectuals. All of whom shared the same progressive ideals. In 1893 these innovative and frequent experiments culminated in one building. With Hotel Tassel Victor Horta produced a veritable Art Nouveau manifesto. Paul Hankar built his own house in Elsene's rue Defacqz (Defacqzstraat) and Henri Van Den Velde wrote 'Cleaning Up Art'. They were pioneers of a completely new decorative style which would be copied all over Europe until the eve of the First World War. In Art Nouveau, new industrial materials were being used in private as well as public buildings. At the same time an attempt was made to create a harmonious style with the frequent use of arabesques, symbols of femininity and energy. It had become a successful formula which was applied to everything. In no time at all countless Brussels single-family homes were erected in this style, allowing the city to take up a privileged position among European capitals. In these houses, often only a few metres wide, the emphasis was on the decorative façades, as example The Cauchie House. But Art Nouveau was also applied to department stores such as "A l'Innovation" (Horta, 1900), "The Waucquez Warehouse", now the Belgian Comic Strip Center (Horta, 1906) or "Old England", now the Musical Instruments Museum (P Saintenoy, 1899). The Belgian Comic Strip Center has enhanced its prestigious, splendid Art Nouveau store designed by architect Victor Horta. The building, inaugurated in 1906, originally served as a warehouse to textile baron Charles Waucquez. This period (late nineteenth - early twentieth century) coincides with the beginnings of modern comic strips. In 1975 architect Jean Delhaye, a student of Horta's, succeeded in bringing the Waucquez warehouse, which had become an endangered masterpiece, to the attention of the state. The building was listed. Now all that was left was to find a worthy new role and… the financial means to restore the building. In 1983, urged by a couple of enthusiasts for urban development (Jean Breydel) and comic strips (Guy Dessicy), the Belgian Secretary for Public Works bought Waucquez Warehouse from the owners' heirs with the express intention of securing the building in order to dedicate it to the promotion of comic strips. In 1984 the “Belgian Comic Strip Center” was founded as a non-profit organization. Its first chairman was Bob De Moor, Hergé's well-known assistant, who had supported the project from the very beginning. The organization's aims were simple: to promote comic strips and to maintain the architectural masterpiece that housed the project. On 24 April 1986, the launch of the project was celebrated in the presence of the entire Belgian comic strip community… in a building which was still very much a ruin. Some intensive lobbying took place, including a sumptuous lunch at the Royal Palace with twenty major comic strip artists and a soirée with the entire Belgian comic strip community, the Belgian Comic Strip Center's founders and the Belgian Secretary for Public Works. Then it was time for the restorers to move in. These had been appointed by the Régie des Batiments de l'Etat (1987) and were represented by architect Christian Lelubre. The architect who assumed the task of drawing up the restoration plans, taking Horta's work into consideration and avoiding 'fake classicism', was Pierre Van Assche. The days of carpenters, glaziers, painters and floorers are long gone now. The building has become a magical place once more. Almost twenty years have elapsed since the opening of the Belgian Comic Strip Center. Twenty years at the service of comic strips and Art Nouveau. Twenty years of encounters. Twenty years of forging links between the world of comic strip artists and their readers. Twenty fascinating years for those who work at the Center. A promotional tool, an exhibition venue, a research centre, a cultural ambassador: in more than ten years the Belgian Comic Strip Center has become a major museum with international appeal, one of Belgium's most popular tourist attractions with 200,000 visitors a year… and government subsidies which amount to less than 10% of the working budget. 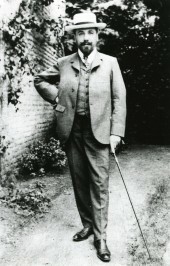 Victor Horta, the son of a Ghent cobbler, loved music. But at the age of twelve he was expelled from the Conservatory because of a lack of discipline. He enrolled at Ghent Academy, in the architecture department, and was awarded his first medal at the age of fifteen. Two years later he left for Paris where he spent more than a year in painter-decorator Jules Dubuysson's workshop. 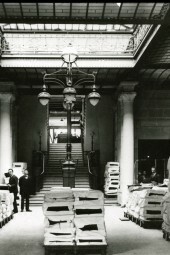 On his return to Belgium, he took up an apprenticeship at architect Balat's (who designed the greenhouses at Laeken) and won one award after another. In 1885 Horta designed some of his first houses. But it is Hotel Tassel (1893) that first brought to light Victor Horta's enormous original talent: he invented a completely new code which would be used all over Europe until the eve of the First World War. Masterpiece followed upon masterpiece: Solvay House (1898), Maison du People (1899), his own house (now Horta Museum, 1901), department stores such as Innovation (1903) and Waucquez Warehouse (1906). It is at this point that Horta experiences the very height of his career. Victor Horta was showered with praise and in 1932 the title of baron was bestowed upon him.